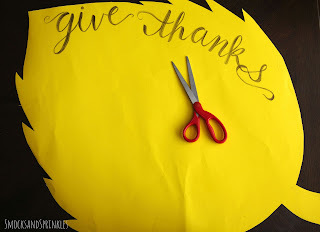 I know we keep coming back to this, but compassion and empathy are so important in the development of our kids, so we decided to capitalize on an upcoming holiday to try out a fun activity. The return of the Pumpkin Spice Latte (drools) means that Thanksgiving is just around the corner and I thought I'd get ahead of the game by prepping a cute idea I saw floating around to make an advent calendar for Thanksgiving. 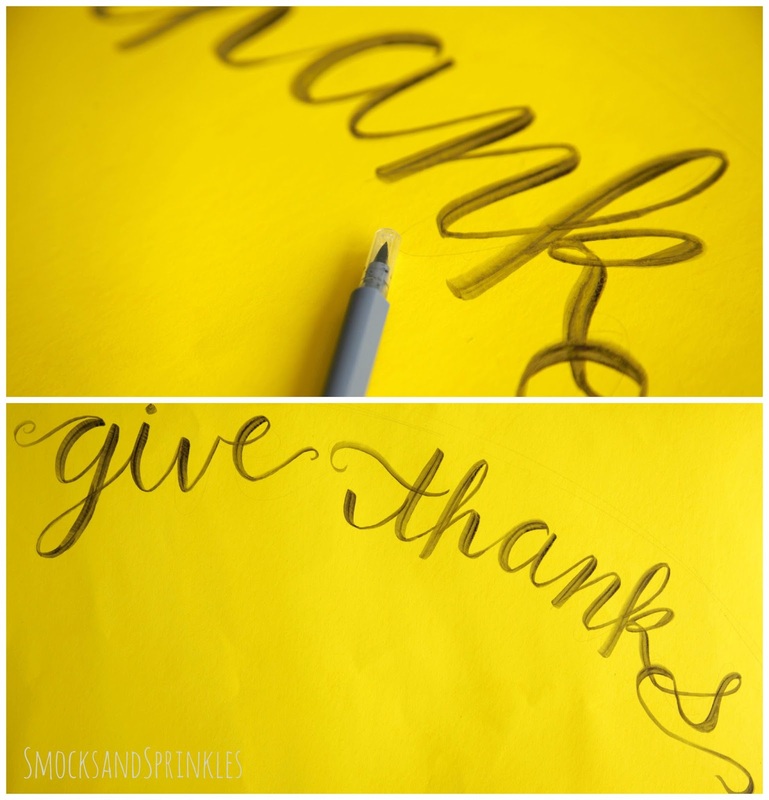 It gives your kids a daily opportunity to write down something they're thankful for, or to perform a random act of kindness for someone! We're all about helping our kids develop emotional intelligence, empathy and compassion, so this was right up our alley. A thankful attitude can also help combat or replace a complaining attitude, and we could all do with a little less whining from our littles, am I right?! I came up with my own design for this calendar, and was really tempted to make a ridiculously complicated felt version, but decided not to feed the crazy and opted for a simple paper one. The nice thing about this craft/activity is that you can personalize it for your family, your child's age, and for any season (not just Thanksgiving!). I'll explain the materials and method I used to make ours, but you'll see that it's super-customizable. It's also fun to get your kids involved in helping make this calendar! I had good intentions and printed out some number outlines for my toddler to color in. I somehow forgot to limit the marker colors she could use and I eventually decided not to use them. I'm hoping she doesn't remember ever coloring them. My inner craft control freak just couldn't deal with the green and purple. Don't be like me. Let your kids participate. Tip! 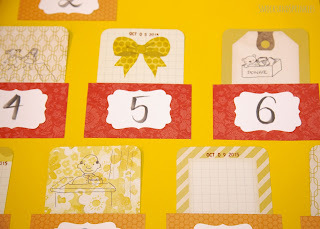 If you're feeling super-crafty, make this calendar out of felt so it's more durable for annual use! 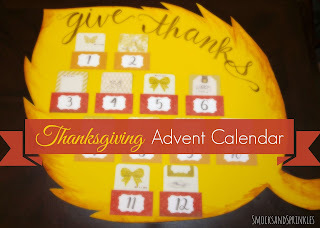 Decide how many days of Thanksgiving advent you'd like to do. 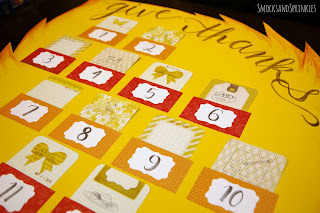 I decided on 12 days so that I could start on the 1st and go right up to Thanksgiving (we're celebrating Canadian Thanksgiving). American Thanksgiving is on the 26th, so you could do 26 days if you want! Sketch out your layout to give yourself enough room for 12 pockets. I decided to be festive and use a leaf shape. 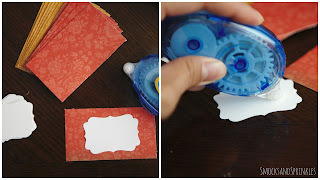 Cut 12 pieces of scrapbook paper to 2" x 3.5" to make your pockets. 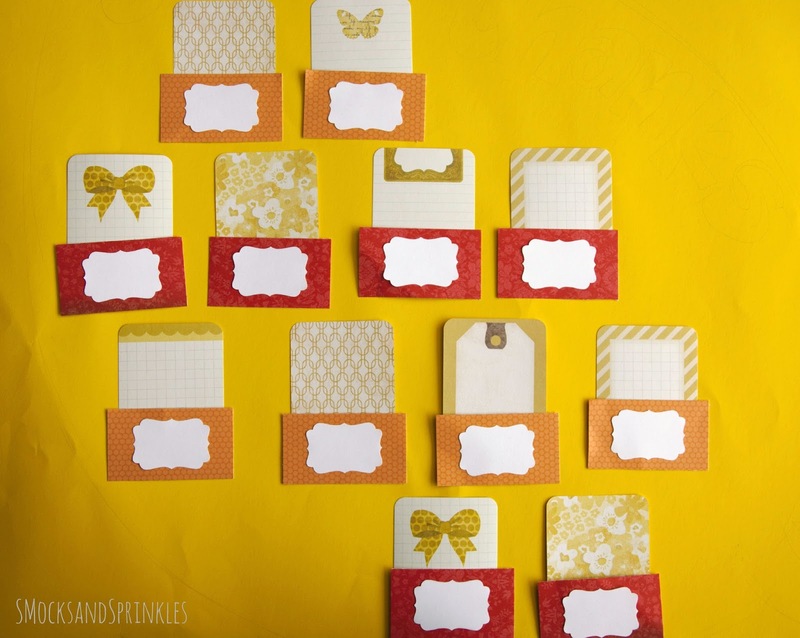 Arrange them on your bristol board making sure to leave room for a title and the card inserts to stick out. 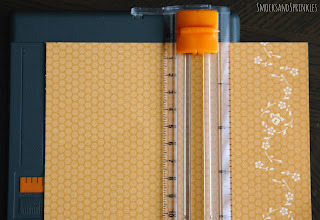 Once you're happy with the layout, run a thin line of glue or other adhesive along 3 edges of the pocket. Adhere each pocket to the bristol board. 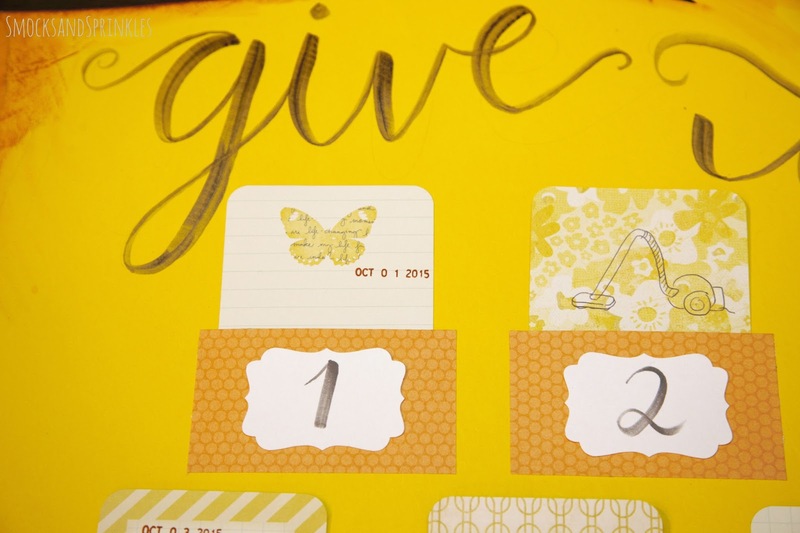 Choose some Project Life cards to put in the pockets. 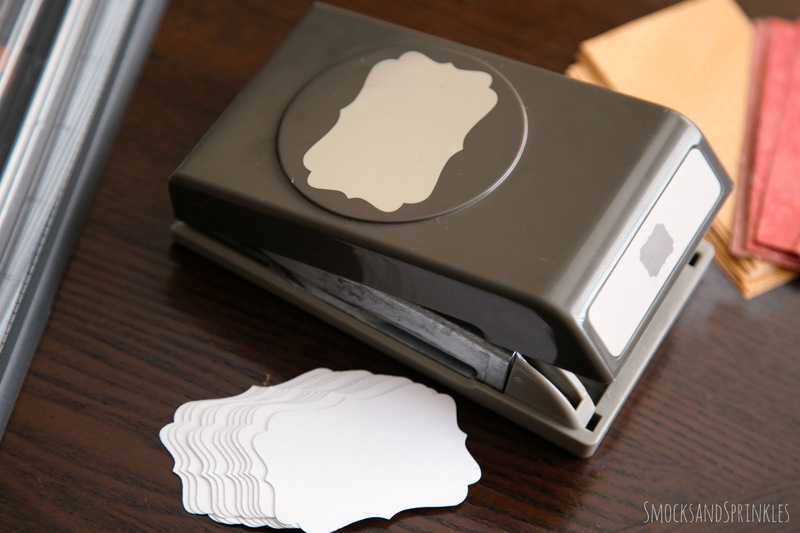 If you're using index cards or paper, cut them to 3" x 4" to fit in the pockets. Leave some cards blank or choose one of the kindness ideas below and write it on a card. 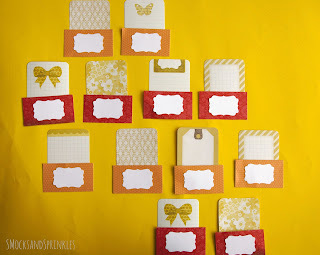 Each day, your child can take out the card for the day and either write/draw something (or have you write it for them) on the blank ones, or perform the listed activity. Tip! Draw a picture for each random act of kindness so that your toddler can figure out what it is without being able to read it. 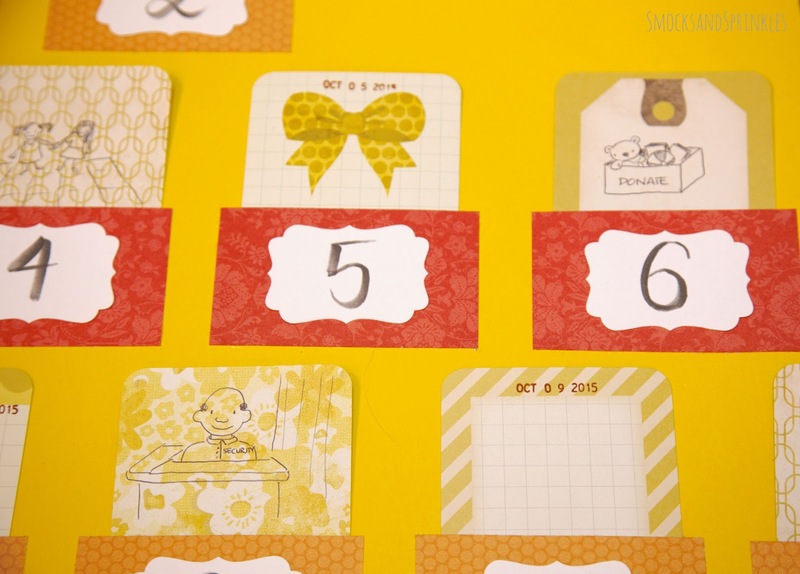 You can decorate this calendar as much as you want! I found cute felt leaf stickers at the dollar store and forgot to use them, but I'm sure they'd look adorable. 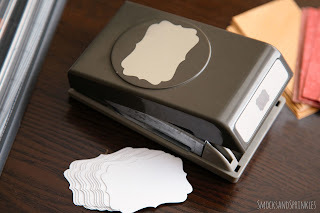 I did remember to punch some fancy tag shapes to write my numbers on! 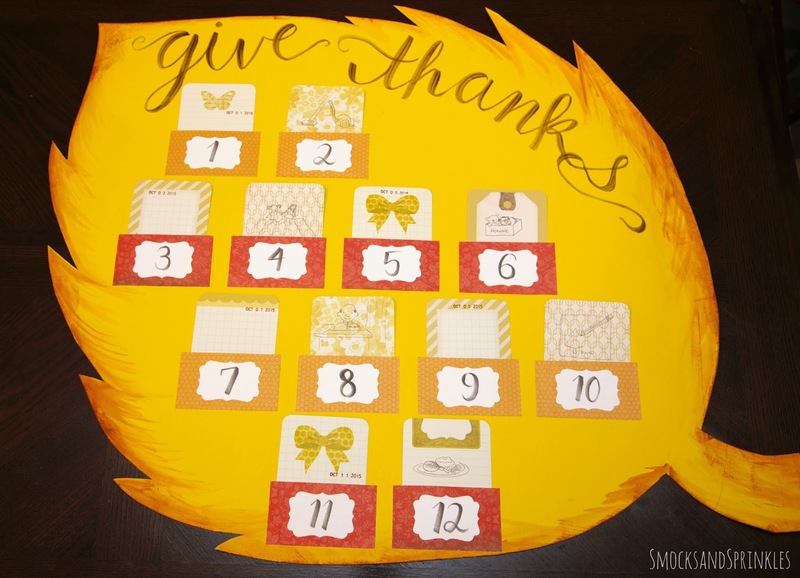 You can write your family name to personalize it and cut the calendar into fun fall shapes...anything goes, because it's your calendar! Tip! Date stamp your cards so that you can keep them and either add to them in the following years, or use them in a Project Life layout! Volunteer at your local food bank, and donate food while you're at it! See our post on the Five Love Languages for other ideas on how to show love! I'm hoping that we can make this Thanksgiving season more meaningful in our family, and start up a new tradition. Let's use this season, or any, to teach your children about giving thanks and showing kindness to others. 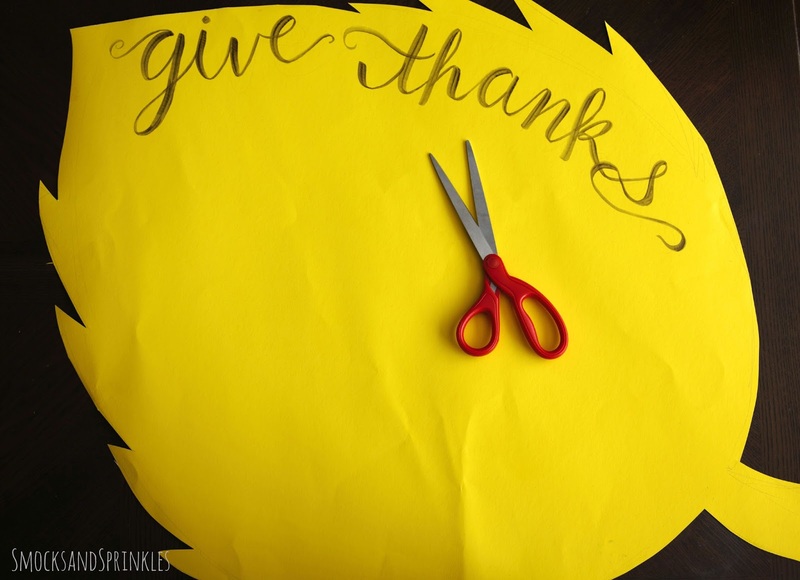 Be sure to share your ideas for getting your kids to be more thankful and kind! Our threenagers can use all the help they can get!